Have you decided or are you perhaps considering to work in Germany? The Federal Republic of Germany is the most multitudinous country of Europe, having 82 million inhabitants. The unemployment rate is currently at approximately 4.5 %, offering many work opportunities. The basic salary is estimated around 1,473 euro. The ten largest cities are Berlin, Hamburg, Munich, Cologne, Frankfurt, Stuttgart, Dusseldorf, Dortmund, Essen and Bremen. Germany, the biggest financial force in the E.U., having an almost zero inflation rate, bases its income mostly in manufacture, commerce, and hospitality industry services. Germany, being a vast market, if not the biggest in Europe, offers many opportunities for development and satisfactory salaries. Furthermore, another advantage is the social benefits that it provides since it is one of the top countries in Europe as far as social and family benefits are involved. Also, Germany has many Greek restaurants, which is something that favours Greek citizens since in our country there is great expertise, know-how and a lot of affection in the catering field. So, if catering is your field, then working in Germany is a very good opportunity for professional development and therefore satisfactory earnings. E.U. member countries’ citizens attain the right to move, work, live and reside freely anywhere within its borders. Thus, Greek citizens are not required to have a work permit when they decide to move to Germany in order to work. They can live there freely at first, while looking for work. They just have to state their address to the authorities using their passport or their identity card. Then, they have to state their intention to seek occupation to the National Employment Agency (Agentur für Arbeit). According to data taken from researches conducted by the General Secretariat for Greeks Abroad from 2010 until 2016 160.000 Greeks have immigrated to Germany. (http://www.ggae.gr ). Work in Germany. The main reason for the majority of them was better employment opportunities. What could perhaps be difficult is to find residence, especially at big cities. House searching is done through real estate agencies, newspapers and the Housing Service (Wohnungsamt). Another factor that requires attention during house searching is several swindlers who promise to find a job for you if you hire them and ask for money as a deposit in advance. You should only trust official employment agencies and be very careful doing some research before you cooperate with people you do not know. Professions that are highly in demand are engineers, craftsmen, and all professions in the Health sector. 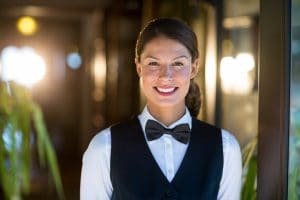 In addition to these professions, hotel, catering and gastronomy businesses are also in demand of specialized work force such as hotel employees, chefs, waiters or barmen/ barwomen. Work in Germany. In EURES network, https://ec.europa.eu/eures/public/de/homepage under European Occupation Services you can find job offers in Germany as well.